Peter ‘Scottie’ Scott had worked hard to sort this out, he arranged for three other chapters to meet up, a Hog to be roasted at the Assembly pub, and actually scouted the ride too! Fantastic effort. Twenty-two bikes from Chelsea were briefed by Scottie, then lead to The Barley Mow on Tilford Green. On our arrival we were greeted not only by the pub landlord, Charlie Barton (ex road-captain in Perth, Aus. 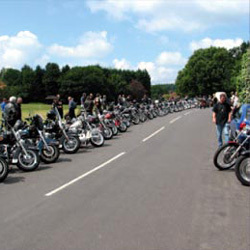 ), but by over 50 massed Harleys from the New Forest and Thames Valley Chapters. No sooner had we parked up to further extend the line of bikes than Surrey Chapter arrived to bring the number to a total of 102 Harleys! We were joined by a superb Panhead Captain America Chopper and a couple of riders who had made their own way to the event to bring the final total to over 105 bikes. Everyone enjoyed it so much we’re going to do it again next year - if we can persuade Scottie.